Kheer is an Indian rice pudding. Rice is cooked in evaporated milk. It is often flavoured with cardamom, rose water, and saffron and is garnished with nuts. 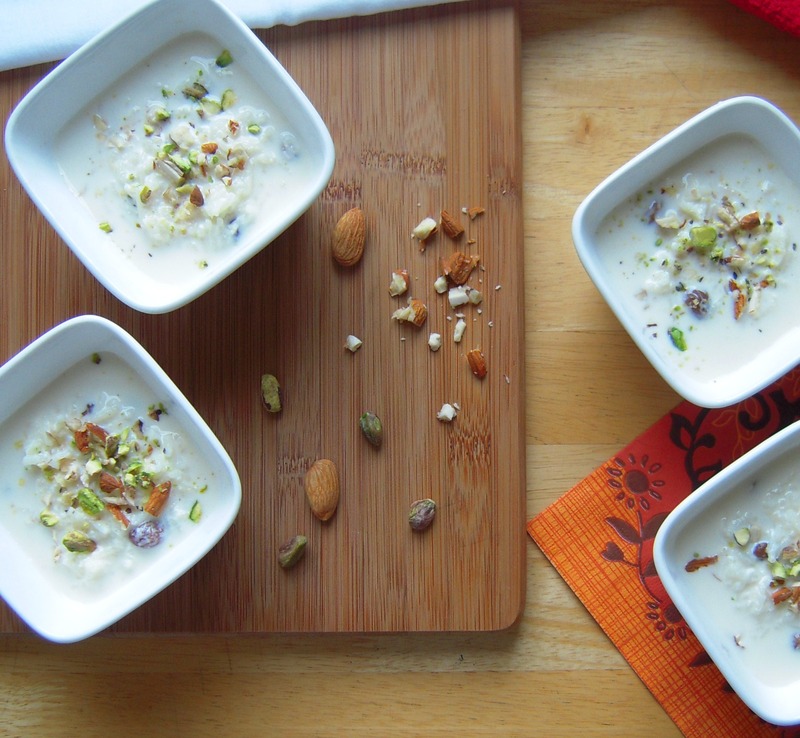 It is a rich milk based Indian dessert and finds a place in the menu on most festive Indian occasions. There are a few sweet dishes that I have grown up eating, Bread Ras Malai, Cardamom Kulfi are among them. Another frequently made sweet dish in our house was 'Kheer'. Although I love it, I don't really make it that often these days, reason being DH doesn't like it much and cooking for myself doesn't inspire me enough to make it. However, on the rare occasions, I make it, I relish the whole lot myself, and I don't mind. 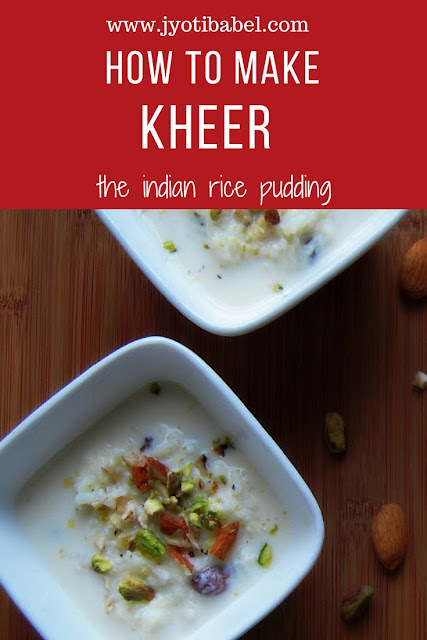 Kheer can be served hot or cold. I like mine chilled with a generous sprinkling of nuts. ¼ cup basmati rice (60 gm). ½ tbsp rose water (optional). 1. Wash and rinse the rice and soak it for half an hour. 2. Heat a pan and add milk. Keep the gas on medium-high and heat the milk till it reduces a bit. 3. When the milk comes to boil (10-12 mins) add the rice. Heat it till the rice is cooked. Keep on stirring gently so that milk does not stick on the bottom of the pan. 4.The milk will reduce by almost half. It will take another 10 minutes. Now add the sugar, raisins, cardamom powder and rose water. Heat for another 5 mins so that the sugar is totally dissolved and take it off the gas. Garnish it with chopped almonds and pistachios. 5. Serve it hot or chilled. 1. Since I used cardamom and rose water to flavour it, I didn't use saffron. You can omit the rose water and use a few strands of saffron. Soak saffron in a teaspoon of milk for a nice colour. It is such a co-incidence...I am eating a bowl of cardamom flavoured kheer while reading your post!! It looks yummy and nicely done. All time fav, sweet things to eat ! 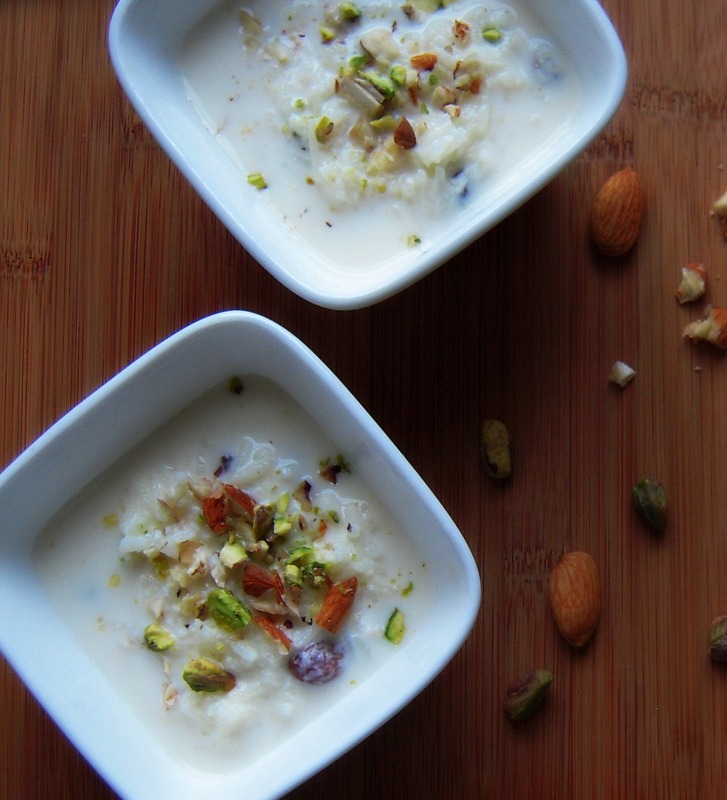 Irresistible rice pudding,very tempting and catchy..
wow lovely kheer and the pics look awesome! very tempting!